Agreement: By registering for any activity with Two Left Feet Dance, llc and any of Two Left Feet assigns, including Two Little Feet, you and the individual or individuals you are registering for classes agree to the policies, liability release and rules of Two Left Feet Dance, llc as indicted but not limited to what is stated below including spoken policies, liability release and rules from any employee or assignee of Two Left Feet Dance, llc. 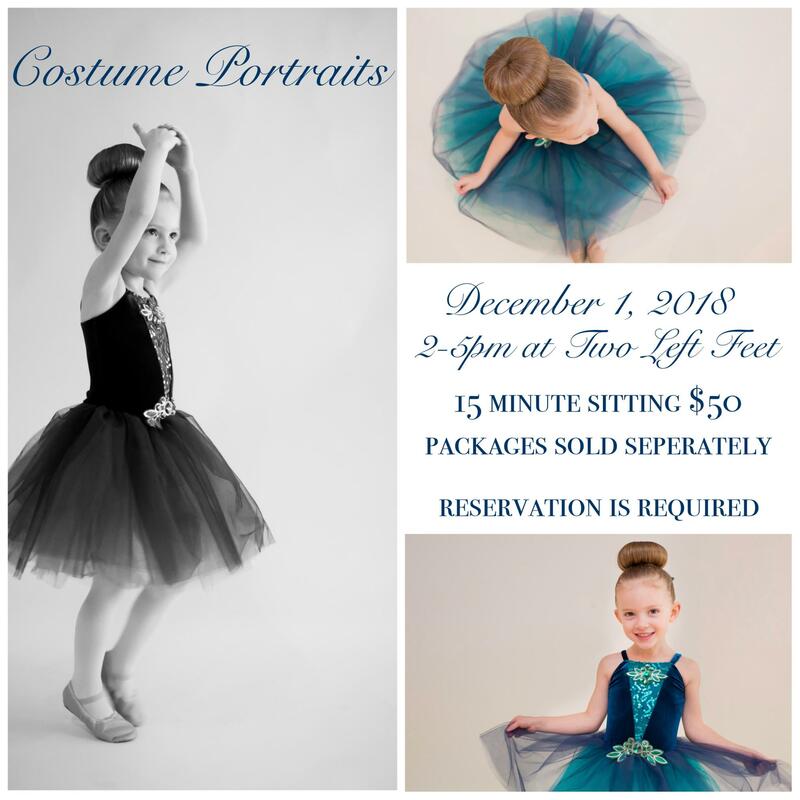 These policies remain is enforceable for any student, adult or child, and anyone enrolled or attending or observing class with Two Left Feet Dance, llc. Rules & policies maybe updated at anytime. Liability release: I understand there is a risk of injury associated with participating in any dance activity. When registering for classes with Two Left Feet Dance, llc, I hereby waive all claims against Two Left Feet Dance, llc, the instructors, assigns or partners of said program, individually or otherwise. I assume full responsibility for any and all damages, injuries or losses that I, and/or the individual or individuals, including any minor child that I am registering on behalf of, may sustain or incur while attending or participating in any & all Two Left Feet Dance, llc activities. Expiration: Unused class credits expire at the end of the 12 week session or 6 months from the purchase date, which ever occurs first. Cancellation/Refunds: Request made on the day of the class, the class will be counted as used. Any request to cancel a set of purchased lessons must be made in writing, email is preferred delivery method, by the fourth class of any session. A refund will be given for the equal class amount minus the first four classes. Any request for a refund after the fourth class will deduct a $25 cancellation fee subtracted from the equal amount of classes remaining in a session.Refund are from the day forward for the remaining classes of a session, not for classes missed. For example: if a student or parent of a student requests a refund on the 6th class of a 12 class session and has only attended 4 classes; the refund would be forward for the 6 classes that have yet to occur minus $25 refund fee. A cancellation request can avoid a cancellation fee after the 4th week by taking the option of a gift certificate. The gift certificate would be for remaining amount forward for a session. This gift certificate expires 6 months from the initial purchase date. Cancellation of a private class: Should you need to cancel or reschedule a private lesson, you must do so 24 hours before you class is scheduled to take place. Failure to give notice will result in your private class be counted as used &/or attended. Returned checks: A fee of $30 will be added to your registration fee for returned checks. Confirmation of enrollment: A confirmation enrollment e-mail wild hold your space. Space is completely reserved when a payment is made. Street shoes destroy the floor. Wet shoes are a safety concern for slipping or wet cold feet. Absolutely NO food or snacks in the studio. * - This Includes coffee from Starbucks. This brings in ants & other critters into the studio, even Cheerios leave crumbs. Strollers must be left OUTSIDE of the studio. The wheels collect dirt & the kids lay on the floor during class. Strollers clutter the area & are a safety & fire escape hazard. Please be aware of your surroundings, we're a dance studio not a trash service. Unless you buy a Starbucks for your teacher, don't leave your cup. All iPads, tablets, video players & phones volume must be turned off or used with headphones. Please use your cell phones outside of the studio. If the call can't wait 30-50 minutes, please step outside. Kids need to hear the teacher & teacher needs to hear the kids. Enjoy visiting with the other parents quietly. Don't yell out directions to your child during class. Let the teacher give directions & help your child before or after class, we encourage it! This also disturbs the other dancers & their parents. NO Tap shoes on wooden floor. Carry your child over to the tap boards. Tap shoes dent the wood & take off the finish. The special dance floor cost $20,000. *For Cleanup: Parents may be fined up to $50 by the studio for bring in snacks or spilling liquid other than water. Director has discretion to cap the size of a class. Class size may be between 10-14. Director has discretion to change the class a child is enrolled if the appropriate age minimum is not met. Director has discretion to cancel enrollment of student for unwelcome behavior including but not exclusive to foul language, hurting or destroying property of the teachers, studio, students, parents or self. Director has discretion to cancel enrollment & to charge a refund fee, if the parent of a child is displaying unwelcome behavior in the studio. All class credits must be used within the session in that which your child is enrolled: Fall, Winter or Spring Session. All returns, refunds, unused classes or credits expire at the end of the session which the class was purchased. Class credits do not carry over session to session. All returns, refunds, unused classes or credits do not carry over to the next Dance Year. All class credits expire by June 15th or the end of the Spring Session, which ever comes first. You can only do a makeup class during the session in which you are enrolled. There is no refund or return or credit for unused classes. Parent allows us to use child's photo or likeness on internet unless written request has been made otherwise. This includes but is not limited to use on our website, online & in-print advertising, Facebook, Instagram, Twitter and all child appropriate internet or mobile applications. Parents may tag themselves on our postings. We do our best to protect the identity of children by not using names or ages in pictures we use. For children's classes only: $20 will be added to payments broken into 2 segments, $30 for 3 segments.